A guest lecture was organized for PGDM –IB students,Batch (2016-18)on “Digital Financial Services-Products and Career Opportunities in India” . 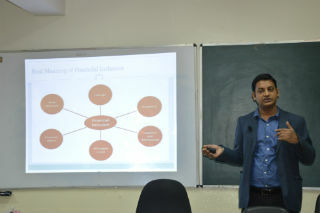 The lecture was taken by Mr. Piyush Singh (Ex-Manager mRupee, Oxigen Services & Barclays Bank Etc.) on 28th Oct 2017. He shared the importance of Digitization in Finance Industry and how a management students can implement this in his career as an opportunity. He shared information and knowledge related to online payments, ATM, Paytm and other financial services. Mr Piyush shared his career journey. He discussed challenges he faced in becoming a finance professional. He interacted with the students and answered queries of the students related to Selecting finance as a specialization in second year. 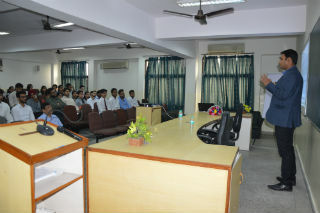 The session was well appreciated by the students.